Cute heart applications in leather,suede and patent. The princess is quite the little fashionista. She definitely has her own sense of style, so when I choose her shoes I know make sure to include her in the decision (or she won't wear them if she doesn't like them). She was visibly enthusiastic while browsing the Vincent store online! She loves pink and color.....which is plentiful at Vincent Children's Shoes. 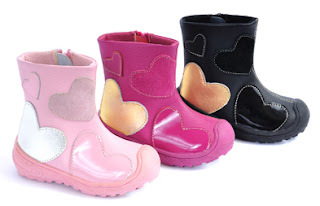 Along with designs that comfort little growing feet, the styles are unique and fashionable. Vincent updates their lines with new styles every season, so when you shop with Vincent Children's Shoes your little one will always have current fashion forward footwear! The princess finally settled on the Fuchsia Linda Boots (Pictured Above) she's a bright pink kind of a girl ;)! While they are adorable in the picture, you really have to see them up close and personal to understand the incredible quality! They are beautiful fuchsia leather, with a sturdy sole, and lined for extra comfort. My absolute favorite feature is the zipper up the side for easy on and off. It makes it much easier for her because while she can't tie her shoes on her own yet, she can zip these darling boots all by herself ;). She's very proud of the new addition to her footwear for the Winter.....I know they will get tons of use.